Portolan charts illustrating the harbors and trade routes of the Mediterranean. Portolan charts, or vellum charts illustrating the harbors and trade routes of the Mediterranean, were an early cartographic form, emerging in Spain and Italy in the thirteenth century. The Beinecke’s collection, ranging in date from the fourteenth through the end of the sixteenth century, includes portolan charts, atlases, and materials on the craft of chartmaking. 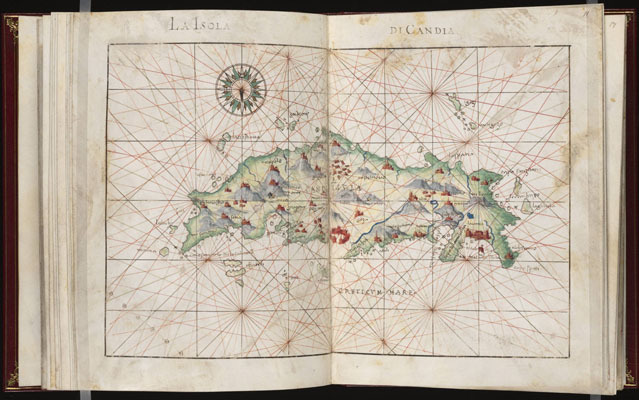 Ornamented by compass or windroses and criss-crossed by rhumb lines (lines showing the direction of the winds or compass points), portolan charts show the importance of a knowledge of the winds and local ports to the Mediterranean trade. Ships and sea monsters people the chart’s sea, while meticulously drawn city profiles, often sporting the city’s colors, offer a glimpse into the bustling landscape of the Mediterranean trade. The charts also show the Mediterranean world imagined by the Italian, Spanish, or Portugese chartmakers, whether in insets of Christ or the new world, or in the lions, camels, and extravagantly clothed inhabitants which populate the charts. The collection offers some insight into the craft of chartmaking, particularly in the sixteenth century. Often the portolan charts include a cartouche detailing the circumstances of the chart’s creation, its date, and the name of the chartmaker. The Beinecke’s collection includes charts by Jorge Aguiar, Jehuda Abenzara, Edmond Doran, and Franciscus Becharius, and three charts by the cartographer Joan Rizo Oliva. A 1559 Venetian portolan atlas by Battiste Agnese includes twenty-three maps of the Mediterranean, Africa, and the new world. MS 560, a fourteenth-century vellum roll, gives its reader instructions on how to situate places in creating a portolan chart.